A panel discussion on the military in Pakistani politics, society and economy; emergency, martial law, and the rule of law in India and Pakistan; the rise and subsequent fall of electronic media under President Musharraf; and the politics of democratic protest in Pakistan. Dr. Ayesha Siddiqa, Visiting Professor, South Asian Studies, University of Pennsylvania and author of Military, Inc. : Inside Pakistan’s Military Economy (Pluto Press, 2007). Anil Kalhan, Visiting Assistant Professor, Fordham Law School. Kiran Khalid, documentary film maker and producer, Good Morning America and director, “We Are Not Free,” a documentary short to be screened at the panel. Dr. Sahar Shafqat, Associate Professor, St. Mary’s College of Maryland and Member of the anti-Musharraf/pro-democracy movement in Pakistan. 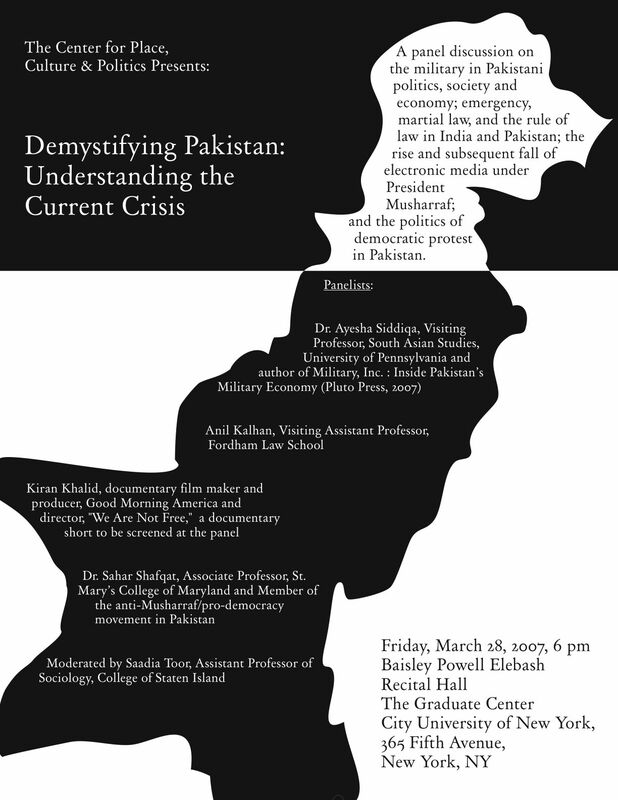 Moderated by Saadia Toor, Assistant Professor of Sociology, College of Staten Island.